Fallout 4 should probably be called “Kleptomania Simulator” or “OCD Trainer”. I literally spend most of my time picking up every single thing everywhere… In the older games, junk was almost totally useless for the most part. You could sell it, but that was the end. For the most part, you just picked up the stuff that was worth a lot and left the rest where it was… In Fallout 4 though, every single piece of trash is extremely valuable, because you can use the components to make stuff. Honestly, for someone like me, Fallout 4 is an awesome game lol. My favorite parts of the game are the settlements, building robots and modifying weapons. I could understand why someone who doesn’t enjoy those things, wouldn’t like Fallout 4. However, the biggest improvements that I’ve seen in the game are related to combat. If you’ve played Fallout 3 or New Vegas, then you should understand how terrible the AI was back then. Not just the AI though… The quantity and quality of enemies in Fallout 4 are drastically higher than the previous two games. It allows for a much more enjoyable combat experience. Then there’s the fact that your character can actually speak. Some people hate it, but I personally think that the voice actors they picked are great. The conversations feel a lot more fluid when your character can actually speak rofl. Leveling is 1000 times better. The level cap in the previous games was always annoying. It meant that you could never really get all the perks and stats you wanted. In Fallout 4, you can literally get every single perk, but you’ll need to reach like level 271. As far as the story goes… Did anyone ever really care about the main story in any of the Fallout games previously? I haven’t gotten that far in the main story, so don’t give me spoilers for Fallout 4. But I definitely remember Fallout 3 have a terribad ending. Like, Mass Effect 3 style. Fallout New Vegas had loads of different endings, but the game ends as soon as you beat the main story line. From what I’ve read, Fallout 4 is more like the Elder Scrolls games… Where you can keep playing even after beating the main story. So I’m looking forward to that eventually… If I ever get around to doing the main story lmao. I turned Codsworth into a giant sentry bot, so that he can carry as much weight as possible. And my character has like 375 carry weight, so between the two of us, we can carry over 700 lbs… Yet I still get over encumbered a lot. Probably because I compulsively pick up every broom and metal bucket I see. I also totally look every single corpse. I miss the Packrat Perk from Fallout New Vegas lol. By the way, Fallout 4 is currently on sale for like 20 dollars on Steam. Here’s the link :P.
Oh yeah, I almost forgot! Power Armor! Power Armor in Fallout 4 is way~ better than the previous games. However, in some ways, it’s a lot more troublesome… I mean, those fusion cores are super hard to get in the early game. But once you have the Cap Collector perk at two stars, then you can buy them for about 350 caps from most general vendors or weapon vendors. 350 caps is a lot in the early game, but you can easily earn a few thousand caps from wiping out a big group of raiders or gunners. There are also a few perks that will let your fusion cores last a lot longer. This entry was posted in Action, Adventure, Comedy, Fantasy, Mature, Reviews, Science Fiction, Survival, Video Games and tagged Fallout 3, Fallout 4, Fallout: New Vegas, Game Review, Mike777ac, OCD, The Elder Scrolls, Video Games by mike777ac. Bookmark the permalink. I guess, but they only cost me like 3500 caps, and I’m almost at level 40… So if I really wanted them, I could easily buy them lol. I don’t have a power armor collection… Yet lol. That’s just a pic from the interwebs. 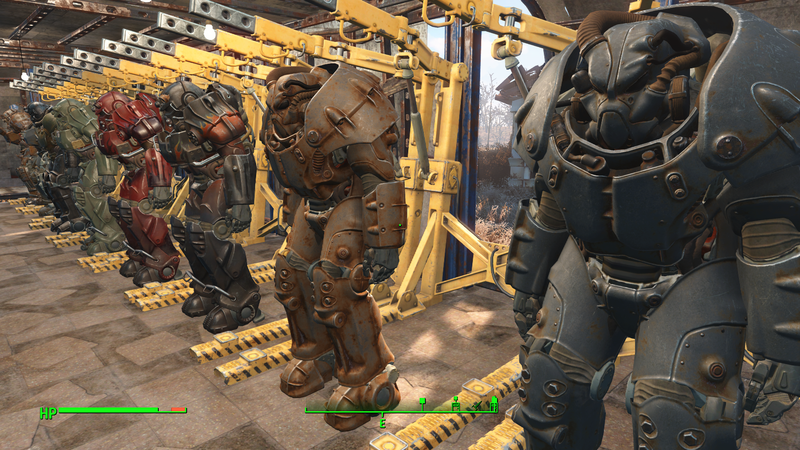 Well, I do have a bunch of different sets so far… But for a power armor frame it’s like 3500-6000 caps. I could buy a few, but I’d rather spend the money on other stuff lol. Besides, I don’t have the perk that lets me buy additional power armor racks, so I wouldn’t be able to do what that guy did anyway.